Hello, pretty little salad. 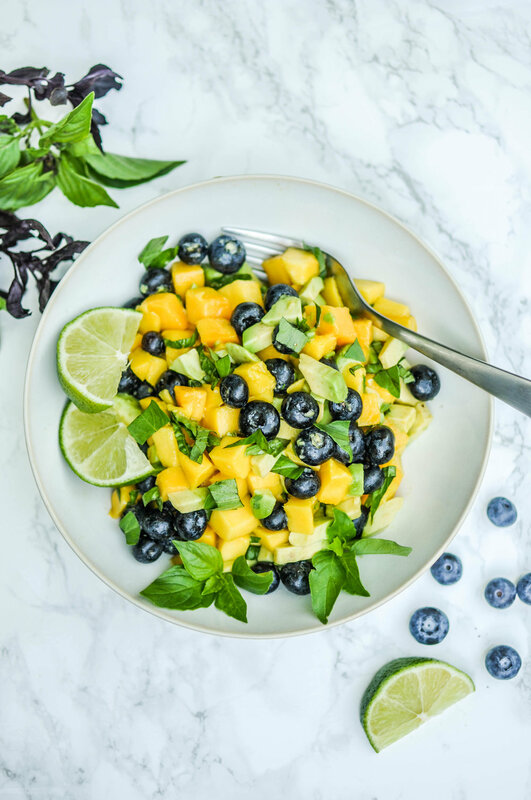 This simple salad of mangoes, avocados, and blueberries is easy to make and full of great flavor! This is a great, quick salad. The key is to have a really ripe avocado and mango. It's a great light lunch for one or as a starter for two. I've wanted to make this salad for a few days, but getting the avocados and the mangoes to ripen at the same speed was a little challenging. Let's just say the avocado got some time in the fridge to slow its roll! I'm coming up to my busiest time of year - when I have two options: prep on weekends and stock the fridge or eat a whole lot of take-out. I know there's always one incredibly hectic month at work and some years I've done the food thing better than others. My plan is to have a bunch of freezer friendly meals prepped this year and then get ingredients for salads and quick meals like this one. It's such a quick and simple recipe to make that it's something I can realistically do on a busy Wednesday night. This recipe doesn’t require any fancy kitchen equipment or gadgets - the only thing you really need is a mixing bowl and what my grandma used to call a rubber scraper. My favorite mixing bowls are these OXO Good Grips ones . In fact, I bought them after a friend accidentally left one at my house after a dinner party and I loved it so much I tried to steal it from her…unfortunately she remembered it and I had to buy my own! Hah. My favorite “rubber scraper” is this silicone spatula - I use it for everything. I hope you enjoy these fresh flavors! This simple salad of mangoes, avocados, and blueberries is easy to make and full of great flavor! Combine the mangoes, avocado, mint, basil, and cilantro in a medium bowl. Serve immediately - as a lunch for one or side salad for two.